The Impact of Fisheries. Fishing is currently the only large-scale resource exploitation that is going on in Antarctica. Most other world fisheries have been over exploited even where controls are in place to prevent this and this has to be a concern for Antarctic fisheries too. Over fishing of particular target species. Effects on other species that depend on the target species as a food resource or are eaten by the target species. Killing of other fish, vertebrate or invertebrate species accidentally caught alongside the target species, the "by-catch". The regulation of Antarctic fisheries is carried out by The Convention on the Conservation of Antarctic Marine Living Resources - CCAMLR. This came into force in 1982, as part of the Antarctic Treaty System. The CCAMLR was established chiefly as a result of concerns that an increasing Krill (picture, right) catches in the Southern Ocean could have serious effects on the population of krill. Krill is a major and vital part of the Antarctic food web and so disturbances to populations could have major and far-reaching effects on the whole ecosystem. The protection of fisheries is different to other controls in Antarctica in that the target is that of a sustainable exploitation rather than of complete protection. As fisheries protection goes, there is a difference in Antarctica compared to other parts of the world in that not only is the particular target species considered, but the effect of fishing that species on other dependent or associated species is also taken into consideration too. Any fishing boats are required to report their catches so that the stock taken can be assessed. The Antarctic Convention Area covers about 10% of the whole earths surface. Currently four species are targeted by fisheries in this area, though there have been other in the past that are no longer active. 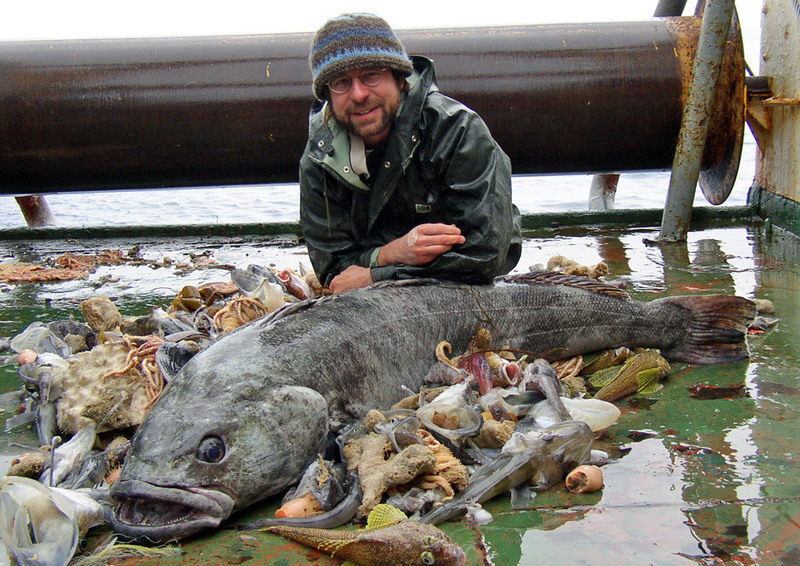 What species are fished for in Antarctica? Patagonian toothfish - Dissostichus eleginoides and Antarctic toothfish - Dissostichus mawsoni- Also known as the Chilean Sea Bass, Merluza negra, Legine australe, Mero and Bacalao de profundidad. Both species of toothfish are subject to illegal fishing by unregistered and unregulated vessels due to the premium prices paid by upmarket restaurants. Pictured right with bycatch. Icefish were heavily exploited in the 1970's and 1980's, the fishing of these was banned in the early 1990's, Fishing of them is currently highly regulated. Krill are the largest fishery in the Antarctic at the present time. 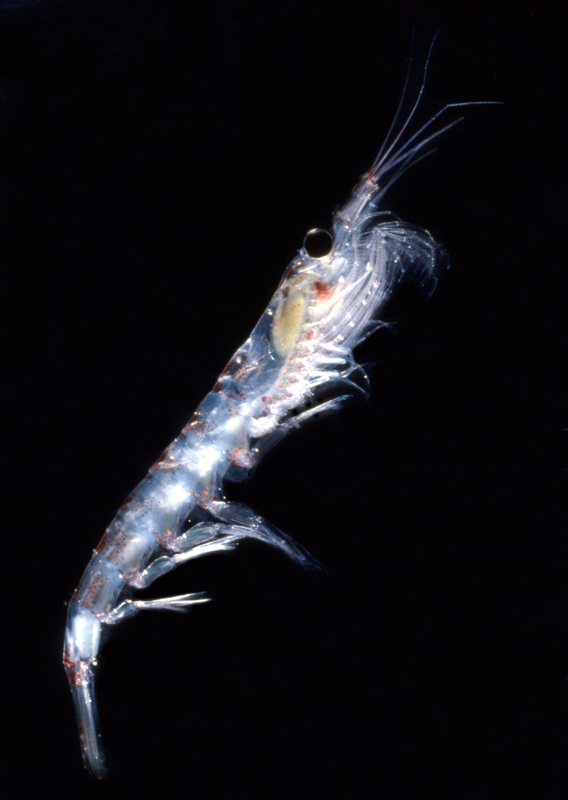 Southern ocean krill is one of the oceans greatest unexploited fisheries stocks. There are a number of reasons that krill is so underexploited, the cost of fishing in the Southern Ocean, and the difficulty in producing saleable products for instance (krill is pretty stinky stuff and not so nice to eat). Krill oils do however contain high levels of omega-3 which makes them valuable to the pharmaceutical and complementary health food markets, a market that started about 2002 and has been growing since. 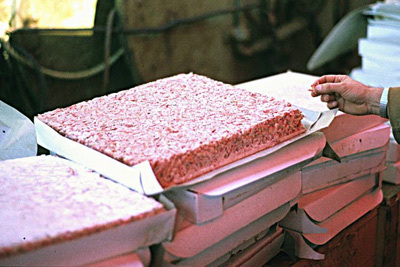 Krill is also increasingly used as a foodstuff to feed farmed fish. Krill are small and delicate creatures though present in enormous quantities. Once you've overcome the economics of getting ocean-going fishing vessels down to the cold, stormy Antarctic Ocean, then a net full of krill will largely be a net full of damaged krill. They may look a bit like shrimps but aren't like them in the manner of the fishery (krill are planktonic), there is also the problem that they start to self-digest quickly after death, so a catch of krill will quickly turn useless for food purposes within 1 to 3 hours if not rapidly processed. It is usually frozen for use as fish food, or boiled and frozen for human consumption, often formed into frozen slabs (picture above right). 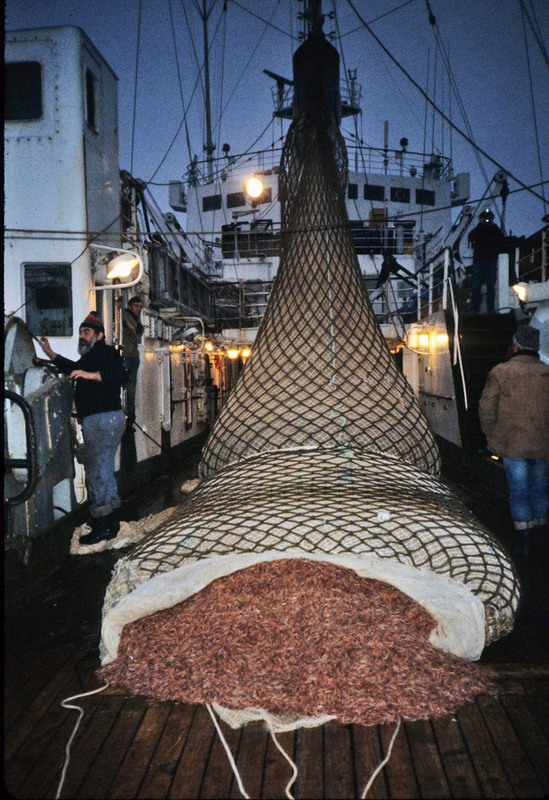 The initial requirement to regulate the krill fishery by 1982 became less urgent due to a slow down in the catch of krill from the early 1990's. Catches of 400,000 to 500,000 tonnes a year through the 1980's dropped to less than 100,000 tonnes by 1993 due to the collapse of the Soviet Union which sent most of the fishing vessels. In recent years, the trend has been upwards again as new markets have been found for krill products and new technologies have been used to fish for the krill. Recently (2013) a new system of managing the krill catch is being devised which segments the krill catch so that not too much is being taken in any one area ensuring that there is sufficient left for predators that depend on the krill. This is dependent on the co-operation of scientists, commercial fishers, fishery managers and Non-Governmental Organizations from a wide range of countries. Until an agreement has been reached, interim limits have been set, for instance in the South West Atlantic sector (Area 48) close to the Antarctic Peninsula and South Georgia, this amount, known as the "trigger level" is 620,000 tonnes, which represents approximately 1% of the estimated krill biomass in that area. Once the 620,000 tonne level is reached, the fishery cannot go beyond this before agreements are reached to spread the fishing effort across the whole area rather than being concentrated. If the fishery is not spread, there is a possibility that local ecosystems could be badly damaged. If available data show that the fishery may progress sustainably, then fisheries may proceed beyond the trigger level. So far, the krill fisheries have not yet met the trigger level. The total allowable catch in the SW Atlantic sector is 5.6 million tonnes per year, there are an estimated 60 million tonnes of krill in this sector. This area is the site of current krill fishing in Antarctica, in the Scotia Sea, around the Antarctic Peninsula and across to South Georgia around the many islands of the Scotia Arc, though in the past krill has been fished from the other areas and of course may be done so again in the future. CCAMLR splits the Southern Ocean into 3 sectors called Area 48, Area 58 and Area 88. Krill was originally fished by trawl nets which had the great disadvantage of causing much damage to the krill themselves, the nets would catch about 10 tonnes each time they were set and could be set 10 times a day. More recently the rate of catch has increased very significantly by newer technology that also results in much less damage to the krill. An air bubble lift is combined with a trawl net which lifts the krill to the surface preventing them from being damaged in the net, these nets can remain submerged and actively fishing for weeks at a time. The krill arrive on deck relatively intact, previously there would have been much leakage of their bodily fluids and spoilage of the catch. There were issues that fur seals were being captured in krill nets and killed, CCAMLR made it a requirement that such nets are fitted with exclusion devices that allow the seals to escape pushing them away from the direction the krill take. There have been no reports of fur seals caught in nets since these devices were fitted. There are concerns that the reported catches of krill are lower than the actual mortality of the krill. While some krill may arrive on deck after being caught by the net, there are reports that large numbers are killed by the more forwards sections of the net before being caught in the end, so what is seen and measured is only a proportion of the whole. 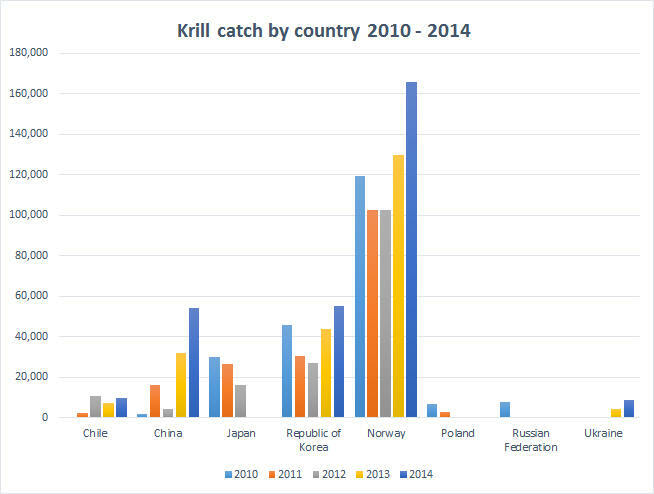 There is a consensus across experts from scientists to NGO's to the fishing industry that krill stock is declining being less abundant than it was 50 years ago. It is probable that the Antarctic krill fishery will increase over the next few years, for instance China has let it be known that it intends to exploit Antarctic fisheries for the good of its people. 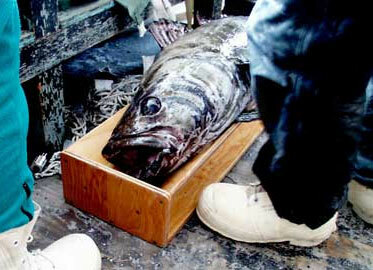 Antarctic non-krill fisheries have already been damaged. In the late 1960's the Soviet Union targeted marbled Notothenids (sometimes referred to as Antarctic cod) and icefish around South Georgia. 400,000 tonnes was taken in the in 1969-70 season followed by a rapid decline from which the stocks have still to recover fully. More recently the cause for concern has been two species of toothfish, the Patagonian toothfish (Dissostichus eleginoides) and the Antarctic toothfish (Dissostichus mawsoni) - This fish represents something of a marketing coup, it is not an attractive looking fish at all, the original name is not terribly appealing but it makes for excellent eating. It is known in the American market as the Chilean Sea Bass and in other markets variously as Merluza negra, Legine australe, Mero, Butterfish and Bacalao de profundidad. The fish are generally not presented whole, but filleted or otherwise processed. The result has been that there is a great rise in popularity and a demand that far exceeds the set quotas. As it commands a premium price in restaurants, there are plenty of more than willing unscrupulous fishermen who are prepared to illegally fish for it. It is generally caught in the sub Antarctic. The number of different names that it goes by in different countries also adds to the difficulty of regulating the fishery. These fish can grow very large, up to 100kg though most caught specimens are around 7-10kg, they are thought to live for up to 50 years. Illegal fishing is further cause for concern as the types of people it attracts are generally not concerned about the use of questionable or illegal techniques that can cause the death of non-target species as by-catch. Albatrosses in particular are under threat as they are taken inadvertently by long-line fishing as the birds swoop down to catch the bait being hooked and then are drowned. The mackerel icefish - Champsocephalus gunnari is a pelagic fish (actively swims in the water column) it is found around sub-Antarctic islands such as Heard and McDonald Islands, Iles Kerguelen and islands in the south Atlantic such as South Georgia. It was heavily overexploited in the 1970's and 1980's leading to the closure of the fishery in the early 1990's. It may be fished for, though such fisheries may only occur within two years of a population survey if the survey finds that a fishery is appropriate. Previously when fished without controls, there was a high variability in annual catches indicating that the population naturally varies quite widely. Allowing fishing of this species without regular monitoring could result in the removal of stocks in low population years making subsequent recovery much more difficult.